William Sherriff Burman was born on 6 June 1890 in Ulooloo, South Australia to parents George and Harriett Burman and was educated at Terowie School. He joined the army on 18 January 1916, when he was 24 years old. He was attached to the 43rd Infantry Battalion and embarked on HMAT Ballarat A70 from Adelaide on 12 August 1916. Burman’s mother sent a very anguished letter, dated 29 August 1917, to the South Australian Red Cross Enquiry Bureau requesting details about her son’s death. 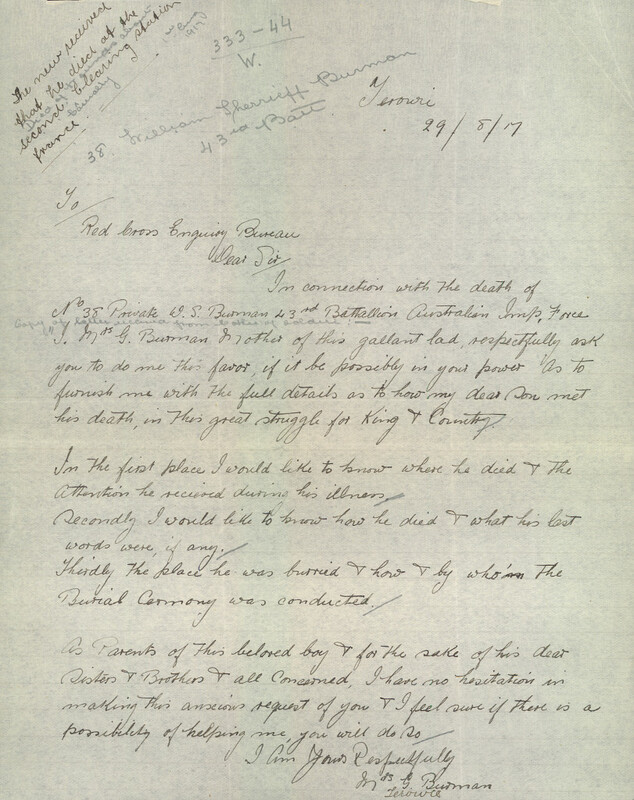 The letter is one example of many in the records of the enquirer knowing of the death of their love one, but desperate for further details about the circumstances of the death. Red Cross searchers gathered a handful of eyewitness statements. One reported that Burman was wounded in action on 31 July 1917 and taken to the 2nd Australian Casualty Clearing Station, Trois Arbres, France. Another eyewitness stated he saw Burman wounded at Warneton and that he was taken to a hospital where he died 7 days later. No specific details of a battle or context as to how or why he was wounded seem to have been gathered from witnesses. Of particular note is an eyewitness statement which offered a different version of events, stating that Burman was delivering water to the frontline and was hit by mortar in the back and died in October 1917. This eyewitness statement was omitted from the correspondence to family, as it was completely inconsistent with the majority of witness statements (and Burman’s military record). It was likely a case of mistaken identity of Burman by the eyewitness. According to his service record Burman died of gunshot wounds to his back, chest and abdomen on 17 August 1917 and was buried the same day at Military Cemetery, Trois Arbres, Steenwerck. A burial ceremony was performed by a Church of England Chaplain, who also provided an eyewitness statement as it related to his mother’s query about her son’s burial. Burman’s mother received a reply dated 9 August 1918, which answered some, but not all, of her questions about the particulars of his death. That Mrs Burman had to wait almost a year for all the details it was possible to gather about her son’s death is an indication of the difficulty in gathering witness statements from fellow soldiers during wartime. We can only imagine the distress enquirers felt while waiting for this information which they hoped would give them some peace in their grief.